Born in Ontario, Susan Shiner moved to Hawke’s Bay, on the Northern Peninsula of Newfoundland, in1972. In 1979, she met Rick Page, also from Ontario, at Woody Point while he was on vacation. Since that day, the two have made their home in Newfoundland. This meeting almost 40 years ago marked not only the beginning of a long love story, but also the start of a shared and steadfast commitment of supporting musicians and other performing artists both on stage and backstage in every possible way. As volunteers, Rick and Susan have opened their homes to performers, housing, feeding and transporting a long list of participants in cultural events as varied as the Newfoundland & Labrador Folk Festival, the Sound Symposium, Lawnya Vawnya and Festival 500. Between festivals, this couple consistently supported generations of local talent, from the most well known as well as the lesser known. Each in their own way, Susan Shiner and Rick Page contributed to some of the most important events in the revival of our folk music and traditional culture through the 1970s and 1980s. 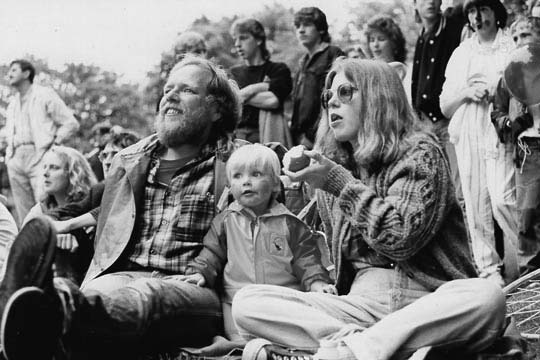 In 1975, the organizers of the Mariposa Folk Festival, in Toronto Island, decided to include performers from Newfoundland. Susan accompanied Rufus Guinchard, her Hawke’s Bay neighbor, to that event. In both 1976 and 1977, Shiner was asked to organize and accompany a larger contingent of traditional singers, musicians, dancers, crafts people and storytellers from Newfoundland and Labrador to that mainland festival. In 1977, Susan, with Isabella St. John and Rhonda Payne, organized the Good Entertainment for Anyone’s Not Used To It festival at the LSPU Hall. With an audience of 600 people, the event featured 26 performing artists and craftspeople from all over Newfoundland & Labrador, including Émile Benoît from the Port-au-Port Peninsula, Becky Bennett from the Northern Peninsula, and Leo O’Brien from L’Anse-au-Loup in Labrador. In 1980 the Terre-Neuviens Français of Cape St. George invited Susan and Isabella St. John to work on the programming and recruitment of participants for the first festival “Une Longue Veillée.” In addition to the numerous talented musicians from the Port-au-Port Peninsula, this festival brought together francophone artists from St. Pierre-et-Miquelon, the Magdalen Islands, Nova Scotia, and New Brunswick. Rick Page, with whom Susan was now sharing her life, volunteered his talents as a carpenter for the construction of stages at “Une longue veillée”. Susan’s commitment to equality for women has shone through all her work in support of musicians and artists. As an event organizer, she took care to put the spotlight on the accomplishments of many women from rural communities. Highlighting the talent, resilience and humour of these women, is in Susan’s view, one of her greatest accomplishment in the folk arts scene. The couple settled in St. John’s in 1984. Rick, a well respected carpenter around our city, has always made it a point to hire musicians on his crews. Rick has volunteered as chief carpenter at the NL Folk Festival for almost ten years. After the birth of their children, Claire and Ian, Susan and Rick took great pleasure to attend the NL Folk Festival annually. Indeed, it became almost a familial duty. As often as possible they volunteered their support to the organizers, a family tradition that they hope will be passed to their granddaughters, Maggie, born in 2015 and Elizabeth, born in 2017.